Technically, there was a night spent in Antigua prior to these two days. I was intending to write about that in my Antigua post, after we return there, however, there was a road accident on the way, which delayed us by about six hours, so we didn't see any of the town at all! We even had dinner in a random roadside service station, with a queue of barely moving lorries outside! It was a very long day, to say the least. 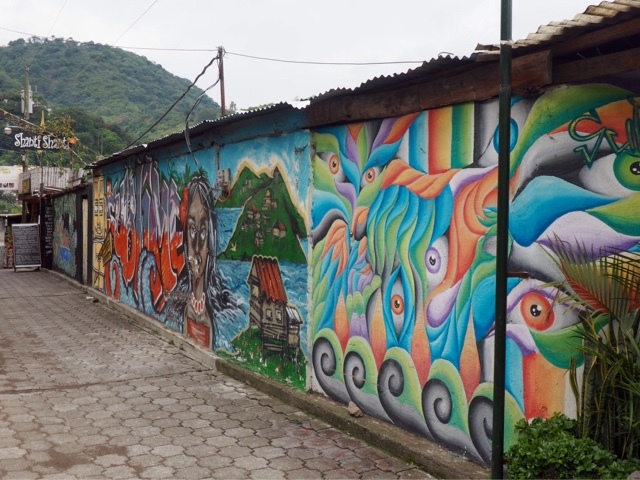 We left Antigua again the next morning, heading up some steep, winding road into the hills, for the market of Chichicastenango. It's a huge, sprawling maze of stalls, that you could very easily get lost in! 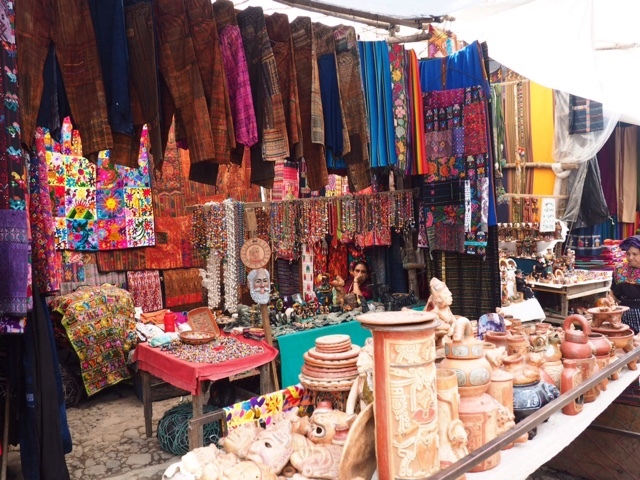 The most dominant thing for me was colour - the chicken buses whizzing past on the road, the tiny Mayan women in their traditional outfits, and the blazes of bright colours on all the goods they were selling. I'm a sucker for jewellery, especially at markets, and I've always bought a lot on holiday in the last, so this time was no different. Jade is the material of choice here, and I wound up with a necklace, earrings, and bracelet, as well as a few gifts to take back home. We had lunch inside the market too, then stopped to pick up some food and treats for our homestay families. 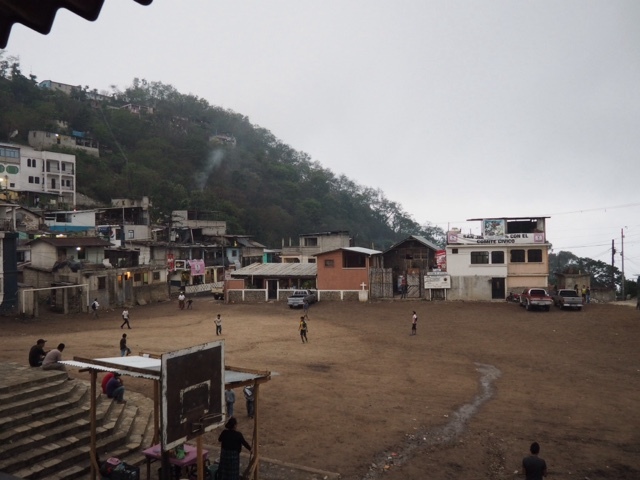 We drove on to the village of San Jorge La Laguna, where we met the families who would be hosting us for the night. The village is home to Mayan families, and their native language is kaqchiquel mayan, with Spanish as their second, so communication was interesting! We brought a piñata along, for the kids in the square, which descended into anarchy when all the boys leapt on it, tearing the poor bear to shreds! Myself and another girl stayed with a couple, Carlos and Patricia, and their two daughters (ages seven and eight), who were lovely! One of the girls tried to teach me how to pronounce kaqchiquel, and Patricia gave us traditional Mayan clothes to wear, which were covered in beautiful embroidery and beading. 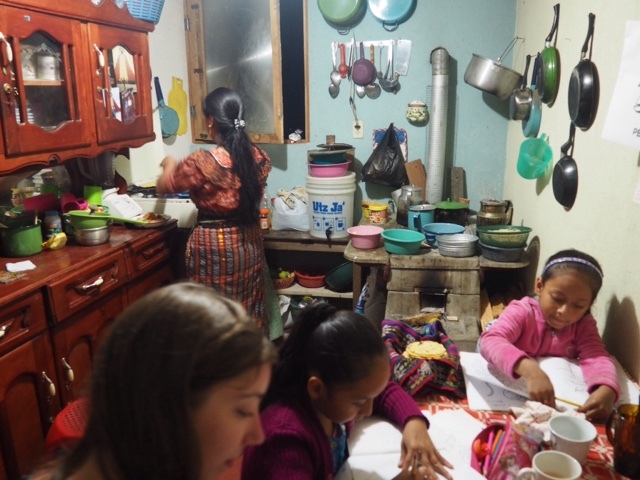 We got to try making tortillas with her, which we weren't very good at it, and she made us dinner of chicken and pasta to go with them. We also coloured in with the girls, then after dinner, they showed us the beaded jewellery that Patricia makes. It requires so much work, and the results were beautiful, so of course, I ended up with two more pairs of earrings! It's a great story to have about where I got them from though. 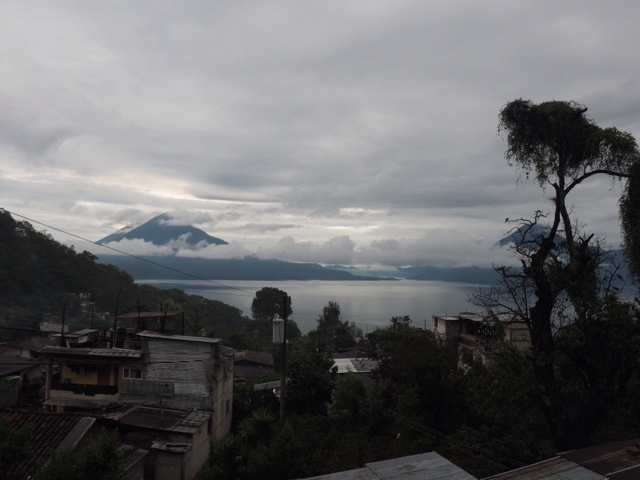 The next morning we opened our windows to the most stunning view of the lake and the volcano opposite us, as some of the clouds had finally lifted, and the rain had stopped. Our host family gave us breakfast, of scrambled eggs, beans and tortillas, before we left the village. 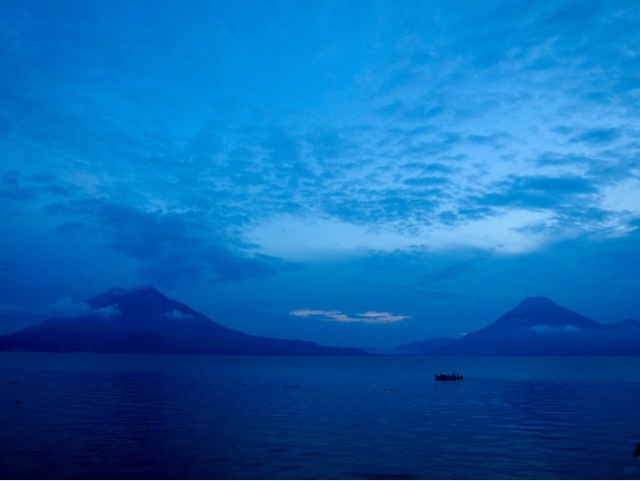 We drove five minutes down the road to Panajachel, a busier town on the shores of Lake Atitlán. The lake has three volcanoes around it, but only one was really visible through the cloud cover. Panajachel is the easiest town to access by land, which is why we were staying there for the night, but the other villages around the lake are more interesting, so we took a boat to San Pedro. There's a very hippie, alternative feel to the village. I loved the cobbled streets, with tuk tuks racing along, and the abundance of brightly coloured buildings and street art. I was slightly less enamoured by the fact that there were more backpackers than locals going about. We went to find the museum, and ended up taking an unexpected detour down the equally colourful back streets while trying to find it. It was well worth the hunt though! The Mayan women running it was lovely, and took us for our own tour around it, to explain everything to us in English. It's not big, but it covers the geological formation of the lake and volcanoes, and the history of the local culture. She explained that the abundance of backpackers in town to party and drink is suppressing the culture, so I was glad we did our part by visiting the museum. We also found out our Mayan signs (mine is Jun Ajpub), which was really interesting. After, we explored the shops, which sold similar things to the market - I haggled myself a leather backpack, with colourful weaving - then went for lunch at Sublime. I liked the wooden building, with open areas, pool tables, sofas and music, but it was swarming with more backpackers. 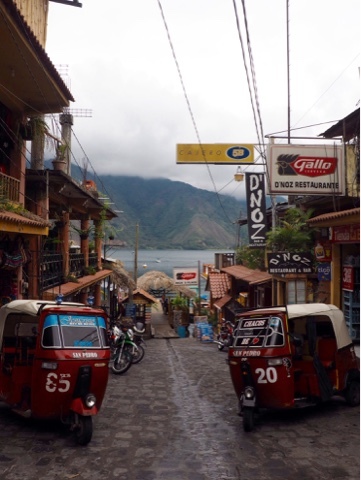 We sailed back to Panajachel later, and had a wander up its streets. The goods for sale are beautiful, but did all start to look the same after a while. I went back down to the docks, to try to watch the sunset, but only really saw a streak of orange through the clouds. However, they did lift enough to finally see all three volcanoes, which was breathtaking. I'd have loved to have seen the lake in better weather, but it was stunning nevertheless. We headed out to dinner at a place called Circus Bar, which was small and dark, but very energetic I, with a live band playing, and served mostly Italian style food. We had some drinks at Pana Rock after, which had another live band, playing more alternative music, and we whiled away the rest of the night there, drinking and talking.